New Year’s Eve Monday December 31st open 5:00-8pm Join us for live music and a German inspired buffet. Reservations are highly recommended. Holiday Menu Join us here or take away and we always offer our award winning catering service! Visit us for Father’s Day Weekend! Celebrate Dad with delicious food and good friends at Angie’s Kitchen. Please call for further details. Come in for our Mother’s Day Brunch Buffet! Celebrate Mom with delicious food and good friends at Angie’s Kitchen. Reservations are highly recommended. Please call for further details. 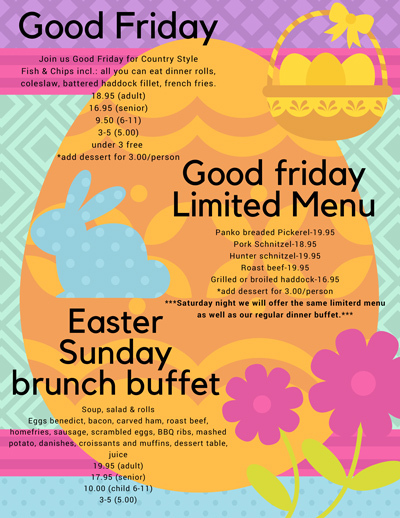 Join us Good Friday for Country Style Fish & Chips! Includes: All you can eat dinner rolls, coleslaw, battered haddock fillet, and french fries.